These are facts that prove, pointed out Noboa, the political persecution carried out by Rafael Correa against me, because I am his biggest opponent and that’s why he wants to eliminate me from the elections. Álvaro Noboa: Ecuadorians, next week, on October 25, in the PRIAN offices in Guayaquil, there will be a celebration of the primaries for the election of President and Vice-President of the Republic. I will be present there as a candidate and I hope to be elected that day, a day I hope will be of national celebration. I will be the next candidate for President of the Republic for the PRIAN for the elections of 2013. May God inspire us all! Ecuavisa Journalist: Counselor, good afternoon, I hope they can hear us well there. There is still time until November 15 for candidates to register. We are talking about next October 25 being the primary election. When are you going to go personally to the National Electoral Council in order to register your candidacy for President of the Republic? 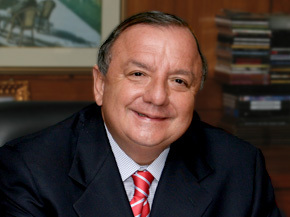 Álvaro Noboa: Immediately after the election. Journalist Mónica Mendoza (Comercio Newspaper): Attorney, good afternoon. What has happened with the conversations with Sociedad Patriótica and with Lucio Gutiérrez? Have you spoken about a possible ticket shared with Lucio Gutiérrez or Lucio Gutiérrez – Anabella Azín? Álvaro Noboa: I’ve never discussed a ticket shared between Lucio Gutiérrez and Annabella Azín. The shared ticket – Álvaro Noboa-Lucio Gutiérrez has been spoken of, and those conversations continue, including in these primaries, only the candidate for the Presidency will be discussed at the moment, leaving open the Vice-Presidential candidate if we were to come to an agreement with Lucio Gutiérrez. I also publicly invite Mr. Guillermo Lasso to form part of this great alliance, because among the three of us we are the three strongest powers in the political country at this moment, and we could, therefore, create a good candidacy. Alberto Vergara (Radio Forever): Counselor, how are you? Good afternoon. Why has the Electoral Council dictated a regulation prior to the elections establishing a prohibition against candidates who have a civil case pending or candidates who have a sentence executed against them? Yesterday, the director of the IRS stated that there are precautionary measures, that cautionary measures are maintained, but not, in this case, your case, that there is a prohibition against leaving the country nor does any prohibition to leave the country exist. This is not a particular situation that can be referred to your campaign, Counselor. 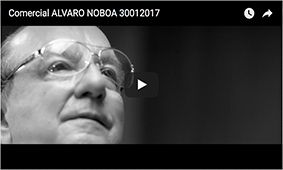 Álvaro Noboa: No, it is not… it doesn’t go against my campaign. What is known already all across Ecuador is that there is political persecution on the part of Economist Correa; that he has seized some of the goods on the day that PRIAN was considered by the National Electoral Council as the party who had obtained the most affiliates, besides Alianza País. That same day, or it’s a coincidence that they seized a series of good in order to guarantee the payment of some $98 million dollars in taxes. And the question that I ask Economist Correa and Economist Carlos Marx is: if we, Bananera Noboa, if Bananera Noboa has to pay $98 million dollars, then Dole, who is larger than ourselves, I would imagine, would have to pay more than $100 million dollars. But to date, they have only paid $700,000 dollars and Mr. Burgos has met with Economist Correa, Mr. Burgos is the owner of Dole, 15 days ago, and Mr. Correa said that he is against the rich and all those things he talked about and how then the rich foreigners are charged $700,000 and Ecuadorian businesses $98 million dollars? I ask this of Economist Correa and I ask the journalists, who at times, I believe, are afraid to ask him those things that I ask him openly: How much are you going to charge Dole for the year 2005? Marcos Carrasco (Universo Newspaper): Counselor, good afternoon. Returning to what you said about the invitation to Guillermo Lasso. Have there been earlier conversations with the CREO candidate? Thinking about a second round in which the PRIAN is not taking part, would you support his candidacy? Álvaro Noboa: The PRIAN is going to be, so in that sense, no… oh, you are saying that if the PRIAN doesn’t make it to the second round? I have no doubts that the PRIAN is going to make it to the second round, and therefore…I, in any case, who I invite once more publicly is Mr. Guillermo Lasso. I have sent him messages of all kinds, this very day I called him on the telephone, but I have not been able to talk to him yet in order for him to meet with Lucio Gutiérrez and me. I am open to there being an alliance between CREO, between PRIAN and Sociedad Patriótica. Journalist: Counselor, does that mean that there will be only one candidate challenging the current President of the Republic in the next elections? You are calling Guillermo Lasso from the movement CREO, and also Lucio Gutiérrez. Journalist: Counselor, why have you decided to return on October 25 to Ecuador? Why haven’t you done so sooner? Are you afraid of being imprisoned, some threat? Because once you return to Ecuador there is a prohibition against leaving the country against you. Álvaro Noboa: Let’s see. In Ecuador there are easy means for imprisoning people when one wants to intimidate them. Judge Posligua is in prison for having given Bananera recourse; then there is also a colleague of yours, the journalist Palacios, who has found asylum here in the Unites States, so he’s effectively a political exile; I have to move with great caution, but I have been able to combine my political caution, like all days, and in this I need to congratulate Rodolfo Baquerizo, our Press Director. Every day I have been in radio interviews, in television interviews, in interviews with all the major newspapers, radios and televisions in the country. I congratulate the New Humanity Crusade, as it continues giving help under my direction, with the assistance of Dr. Annabella Azín, Medical Brigades whereby we give free medicine, where we give free medical attention, we donate computers to schools , where we give work through micro-businesses. They are putting together a list of young people, where there is also open space in case there is an alliance; there could be one consolidated list. This is very important because it that way it would be the alliance list against List 35. Remember that this presidential candidacy is unique of its kind: the Chief of State dearly wishes to intimidate me, to intimidate journalists, and the other candidates. Guillermo Lasso was already threatened with the bank having to pay the bond and if he doesn’t pay it, then the whole of his bank will be taken over by the Sate. Lucio complains all the time, when we speak, that he is being threatened with lawsuits of this and that kind. I think that you, as journalists, must have colleagues who are on the run, or with problems with freedom. If they had the gall to take out a prohibition of departure against me, something that is totally unnecessary because Bananera Noboa has been subject to seizure. There are companies with prohibitions of transfer, there are sufficient guarantees in order to be able to recuperate the charges, that as I said, we don’t owe and that we have been asking for three years to be allowed to litigate in order to prove our innocence in Court. What do they gain by putting Judge Posligua in prison, by ordering a prohibition of departure against me? They’ve won nothing, nothing a cent. What they have achieved is to intimidate me, to intimidate the candidates, and that is not democratic. I don’t believe that this election is a democratic election. This is an race of Correa against Correa and we, well we see it that way, we have presence as a party, but it is an election of Correa against Correa. Journalist: Attorney, this morning Abdalá Bucaram said that you were a great friend, even though you want to take the PRE from him and that at this moment you are in limbo, in limbo and that he recommends that you retire from politics. This morning Abalá Bucaram also gave a press conference via telephone from Panama. How do you respond? Álvaro Noboa: That he is my great friend, too (laughs). Journalist: Just in case there is any approach, say, from Alberto Acosta, in order to respond to this call for unity, with the PRE itself or some other issue, what would your opinion be, for example, about the suggestion to increase the Human Development Voucher? Álvaro Noboa: Look, my plan goes much further than the voucher. My plan goes to all Ecuadorians earning a salary of $1,000, $2,000, $3,000 dollars thanks to training that the businesses are going to give them, thousands of business which I hope to bring to the country. My plan goes towards poor Ecuadorians being able to take those $1,000, $2,000, $3,000 dollars to the Ecuadorian Institute Bank for Social Security, or a private bank and receive a housing loan, or a car loan. My plan goes towards there being zero poverty in Ecuador, that the poor become people of the middle classes, with cement houses, with cars, with well-paid jobs, and with education, both for themselves and their children. Then, I’ll take the voucher given by the government at that time.